Practice makes perfect or in some cases practice is just practice. 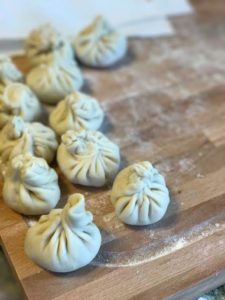 My past weekend goal was to make Chinese Soup Dumplings (Xiao Long Bao). Known also as basket dumplings or XLB, they are probably my favorite dim sum option. So, are you ready to learn how to make them? Well you better get on the Google because I am not an expert….yet! This weekend was probably one of the more frustrating weekends I’ve had in a long time in the kitchen. 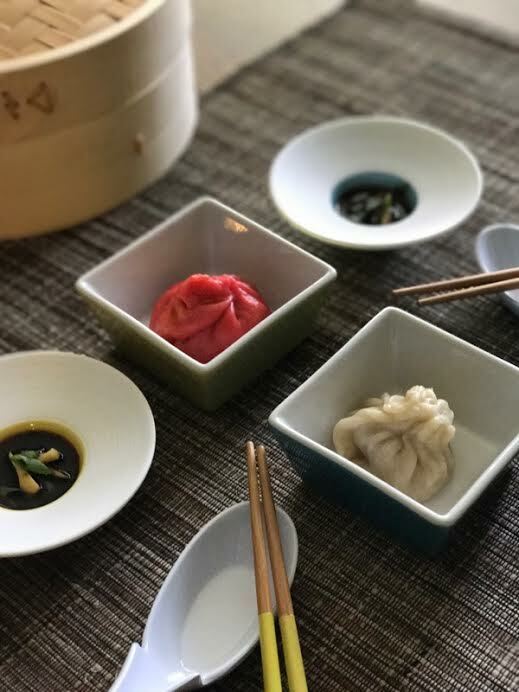 Some of you may be asking….why do people need to know how to eat a dumpling? XLB look like your regular Chinese dim sum but the magic is that it is filled with hot soup. So, if you bite right into it…odds are you are scalding your mouth. The art of eating them is to pick one up with your chopsticks and rest it in your spoon. Give it a little poke or nibble and let the soup drizzle out in your spoon… you slurp up the soup from your spoon and then indulge in eating the dumpling. Sensory speaking it is very exciting and has a fantastic mouth feel. 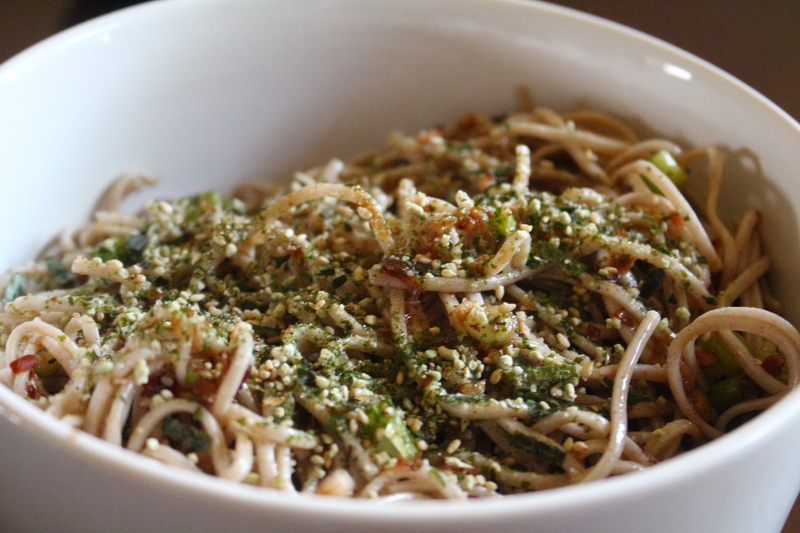 The soup broth is luscious and the filling is an explosion of flavor. It is one of those food things that must be experienced once in life. Challenge 1 is how do they get the broth in a dumpling? If made properly, the “soup” congeals when cooled due to the collagen in the bones and skin used in the broth. For the home cook, this broth is the intimidating part. 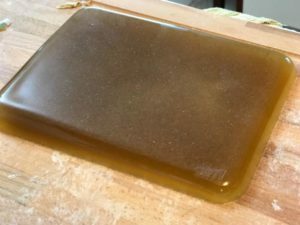 You need things like feet, skin, carcasses and knuckles and honestly, I don’t think that always insures a 100% gelled broth….so there is a little cheat…you can add a little unflavored gelatin to make sure your consistency is correct. 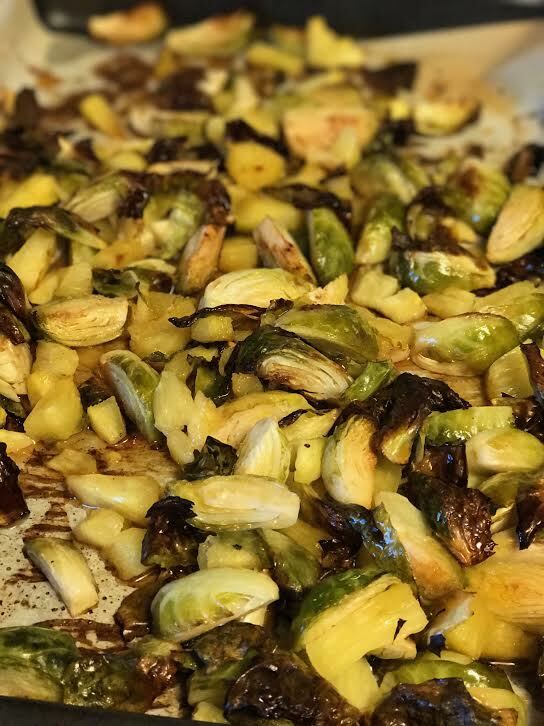 I made two batches this weekend…an “authentic batch” which was only bones, water, skin and seasonings. After multiple store visits, I found it impossible to find the correct amount of the different components to make the broth. I cooked what I had and popped it in the fridge and it turned into jelly but I knew I needed it to be a little more solid if I were going to get it into a dumpling. 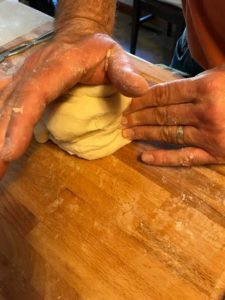 Sunday…I made the dough again using a high gluten bread flour and more water….and I recruited my husband into the kneading the dough. Ta-dah! 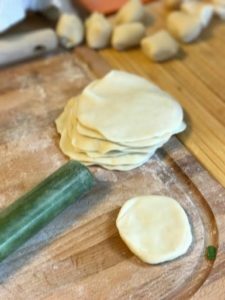 If I would have had a little more patient on Saturday, I probably would have kneaded in more water because like pasta dough, dumpling dough needs to be properly hydrated and rested before you start rolling. Challenge 4 was the filling. 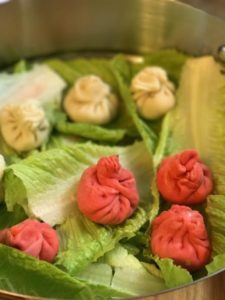 The filling is probably the easiest….mine were made with ground pork, scallions, ginger, garlic, a little soy and Chinese rice wine. Like making a good meatball or meatloaf, the only issues were to make sure I didn’t over mix and I combined it until the meat felt a little tacky. Challenge 5 was rolling out the wrapper. I made 3 inch in diameter circles but I think I used too much dough. I had divided my dough into 48 portions. I either needed to use smaller portions or make bigger circles. Challenge 6 was to physically make the dumpling. 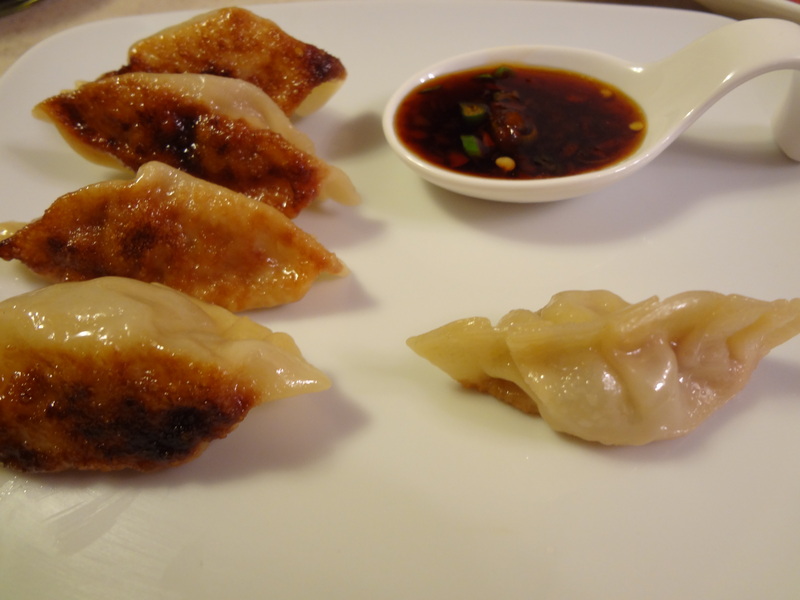 Each dumpling needed some filling, a little cube of broth and then you had to pull and pleat the dough. I think people who make pretty pie crusts would be great at this. I KNOW I could have put more soup/filling inside but I was erring on the side of caution. Challenge 7 was to steam them. I layered my steamer with lettuce leave (cabbage is norm but of course…I didn’t have any in the house.) I placed the steam basket over boiling water (not touching), covered them and steamed them for about 8 minutes. Challenge 8 was the best part eating them. I picked up one and placed it in my spoon. I poked the side…which was the moment of truth…and there it was…a beautiful dribble of broth slowly filled my spoon. SLURP. I added a dab of black vinegar and garlic to the rest of dumpling and took a bite….sooooo good. The final question is will I make these again at home…yes. I like a challenge or in this case…multiple challenges. It is a time-consuming process but the results are so rewarding. I hope the next time I make them I can write a better post on the success and not memoir of mistakes. The one thing I did learn was a HUGE appreciation and respect for the chefs in restaurants like Imperial Lamian who have mastered Xiao long bao and make it look so easy. © Copyright 2019 Felt Like a Foodie. All Rights Reserved. Blossom PinThis by Blossom Themes. Powered by WordPress .